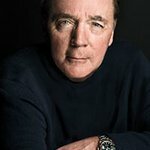 Since his first novel, The Thomas Berryman Number, won the Edgar Award in 1977, James Patterson’s books have sold more than 260 million copies worldwide. His Alex Cross series, including Kiss the Girls and Along Came a Spider, is the most popular detective series of the past twenty-five years. In total, his Middle School, Maximum Ride, Daniel X, and Witch & Wizard series for young readers have spent more than 230 weeks on national bestseller lists, and all four series are in Hollywood development. His lifelong passion for books and reading led James Patterson to launch a website, ReadKiddoRead.com, to give adults an easy way to locate the very best books for kids. He writes full-time and lives in Florida with his family. James Patterson’s activism in children’s literacy and philanthropy has made him a leading voice in the conversation about book culture in the United States. Google trends for "James Patterson"
We don't have any videos related to James Patterson.